My son has been a terrible sleeper. Recently, he didn’t nap all day, and then cried for hours and hours during the night. The next morning at church I saw a woman holding a baby who was fast asleep despite all the lights, lively music and people. Then there was me. Tired, disheveled with unwashed hair, desperately patting, shushing and rocking my baby, praying he would just go to sleep. I thought to myself, “I wish I had a baby who slept like that.” I immediately felt guilty. I had wanted a baby for so long. I was stunned at how quickly I lost sight of what I have when I’m tired or frustrated. I think we all find ourselves at times comparing ourselves with others, and wishing for something more than what we have… a happy, healthy (and sleeping) baby, more money, or a better car, job or house. Or, we wish to be skinnier, prettier, more successful, a better parent or a better spouse. We all know the cliché saying, “The grass is always greener on the other side.” Of course it is. We are looking at someone else’s life from the other side of the fence, from across the room or over social media. We only see what is presented to us. So when we compare our reality of life to someone else’s highlight reel, it’s not a fair comparison. Unfortunately, these thoughts make it easy to get stuck in a rut of negative self-talk, judgmental thoughts and jealousy. So how do we change our perspective? We work harder to experience and express gratitude. Research supports the overwhelming benefits of shifting our perspective to one of gratitude. Grateful people experience a sense of abundance, appreciate smaller things and appreciate others more. They are more optimistic and feel better about their lives. Live longer. Grateful people are more likely to take care of their health, exercise and attend regular checkups, and as a result, live longer. More happiness. Those who are more grateful than others experience more happiness and less depression. Healthy relationships. People who express gratitude toward their partners are more comfortable at expressing concerns and as a result often have healthier overall relationships. Happy for others. Gratitude reduces social comparisons, allowing grateful people to be more adept in appreciating someone else’s accomplishments rather than feeling envious. 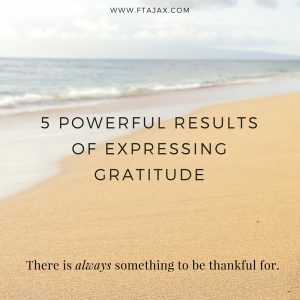 Better psychological health: Being grateful reduces stress, fosters resiliency (so you can better cope with things that come your way), and can help you overcome trauma. It takes practice and perseverance to shift your perspective – you are teaching your brain a new way to think. The good news is you can start right now and the benefits are huge. Keep a gratitude journal beside your bed and write one short entry of gratitude at the end of each day. Make a point to express your appreciation and gratitude to others around you—your coworkers, spouse, friends, and family members. When you’re tempted to complain on social media or to others, choose to express gratitude instead. After a grueling sleepless night and rough morning at church, later that day at the grocery store I looked down to see my baby passed out. He was sound asleep despite the lights, noise and people. It was a sobering reminder that things aren’t always what they seem. I laughed to myself thinking someone could see me now and think, “I wish my baby slept like that.” I got a bold lesson in gratitude that day and a not-so-subtle reminder to be grateful for all the ways I am blessed. So what are you grateful for? What is good in your world today? Need help shifting your perspective? We can help. Consider individual therapy or couples counseling.